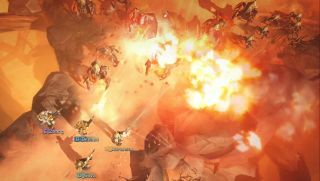 Magicka developer Arrowhead is back with four-player co-op twin-stick shooter Helldivers, a game about bringing liberty and democracy to a galaxy that doesn't seem to want it. Helldivers was first released as a PlayStation exclusive in March, but what developer can resist the allure of the personal computer? "We have done our very best to ensure that the game will feel as good as possible when played on PC," CEO and Game Director Johan Pilestedt said back in November. "With a wide range of graphic options, rebindable keys and an added text chat, we hope that we will meet the expectations which players have of a PC title." As you might expect from a studio who made an art out of blowing your own mates into orbit, friendly fire is on and encouraged. Well, not encouraged, but if a friend just happens to wander into line of sight, that's really more their problem than yours, isn't it? That sounds super, and Steam reviews are 'overwhelmingly positive'. If you're looking to sever what family ties remain this Christmas, you can get them playing Helldivers for £16/$20.